A hundred years ago this January a number of developments occurred on the Underground that might be mentioned. 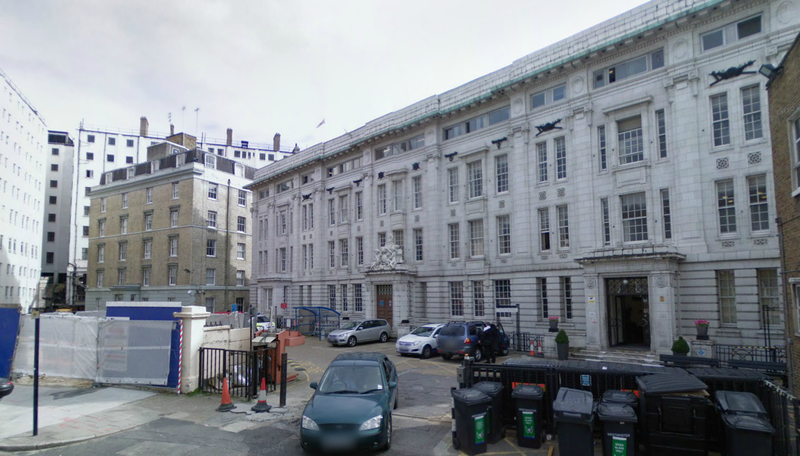 The Metropolitan Railway moved into its huge new offices at Baker Street, for a start. Today, the Metropolitan seems inextricably linked with Baker Street but before 1914 it was just a modest junction station and the Metropolitan worked from offices dispersed across several locations in west London and had little presence at this station. To improve efficiency it was desired to bring all administration to one place, achieved in January 1914. As part of the station reconstruction, described last month, a new four storey office block was built on land along the eastern side of the station. This was on a site filled with older blocks of buildings, fronting Allsop Place, that the railway bought in stages over a decade or so. The new offices included two wings at the rear that projected over the rebuilt platforms, though only at ground and first storey level. In the north wing a lift was installed, allowing directors and senior officers direct access to platforms 1 and 2. The exterior frontage of this unnamed building is in remarkably good conditions but the interior has been so comprehensively modernized over the years that there are virtually no original features evident. The building should not be confused with Selbie House, an unconnected building next door, which so far as I can tell is the only survivor of some blocks together called Cornwall Mansions that came into Metropolitan hands at about the same time and were merely adapted for railway purposes; the other buildings were demolished. A comprehensive history of this fascinating site is called for at some time (perhaps when I’ve a moment). 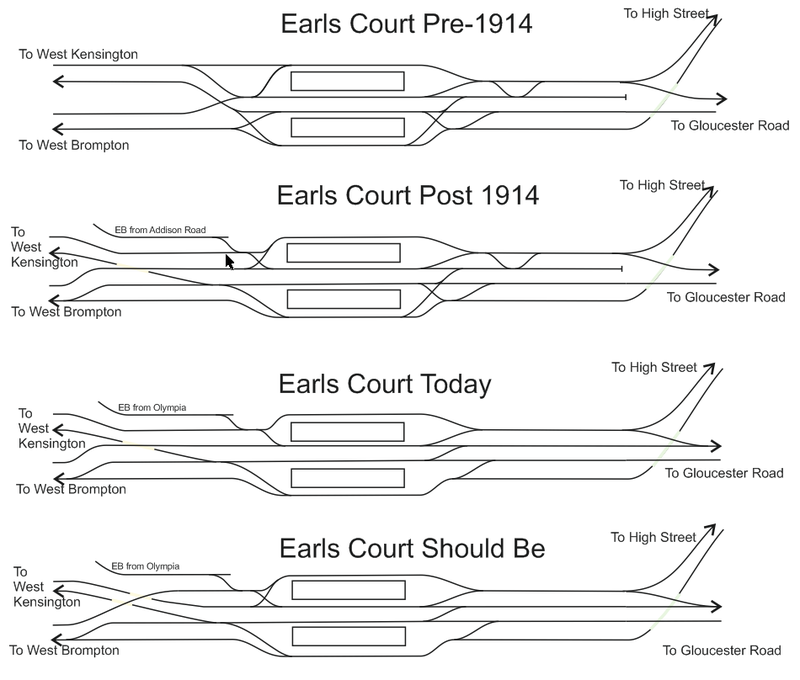 On 4 January 1914 the Earls Court flying Junctions were opened west of the station. The need for these junctions arose from the rapid development of the Wimbledon branch train service and the ‘local’ service from High Street to Putney Bridge. As things were, there was a flat junction west of the platforms where the westbound Hammersmith service crossed the eastbound line from Putney on the flat. The pointwork here included some viciously sharp curves and trains had to pick their way across this lot at slow speed creating a major bottleneck. It is a curious thing that to the east of the station near Cromwell Road there had been a flying junction where westbound trains from High Street passed under the main District tracks and had been able to do so since 1879, even though the service was not particularly frequent. The works west of the station involved passing the westbound Hammersmith line beneath the eastbound Putney line, both of which were diverted onto entirely new alignments, moving the crossing points somewhat to the west. The new westbound line dropped rapidly at 1:30 beyond the Warwick Road bridge while the realigned eastbound line rose between West Brompton and the crossing point, then dropped at 1:40 before passing underneath the Warwick Road bridge. The alterations were necessarily carried out in stages between 21 December 1913 and were largely complete by 12 January 1914. The new eastbound line was entirely in open air while the westbound was in a brick tunnel (except where the tracks crossed by means of a new bridge, D91A). At Earls Court station, the northernmost track (against the wall) was designated the ‘main’ road, and the other side of the island was the ‘local’ road, connected to the line from Putney. It might be wondered why the flyover was not arranged to take the Putney Line to the platform against the wall as many of the trains would have been going on to High Street. The reason is that it simply did not matter in those days because the eastbound lines converged east of the platforms for about half a mile so there was no advantage in undertaking the extra work to divert the eastbound Hammersmith track as well as the westbound. The disadvantage of not having made this extra little bit of investment did not manifest itself until 1966 when, by reconfiguring a siding, independent tracks were available all the way from Earls Court to the junction with the High Street line. Now, of course, the 1914 arrangement west of the station showed itself imperfect, as it meant trains from Putney for High Street got in the way of those from Hammersmith to Gloucester Road. This may not have mattered much when traffic levels were dropping, but in a world where traffic is increasing and looks like it will continue to do so, then delays created by historic track layouts become ever more irksome. I mentioned in my Blog of 1 December 2012 that London was about to miss an opportunity to sort this out at low cost. The suggestion was that the Earls Court area redevelopment scheme will see the demolition of the exhibition hall built on the site over the existing tracks and afford a once-in-a-century opportunity to realign the flying junction so the westbound line from Putney crosses both Hammersmith lines and not just the one, as now. This isn’t going to happen – the business case is too weak, we are told. I don’t doubt that this is so, were LU to meet the full costs of the work and a relatively short term payback is factored in (maybe 40 years or less). I do think that had the idea been seized upon earlier it could have been part of a wider scheme that Section 106 funding would have paid for in its entirety (that is money paid over by developers who benefit from the planning benefits they obtain) and had that been done then the business case could surely only have been positive. I can do nothing but agree that new automatic signalling and an additional crossover will much-mitigate the conflicts here for some years. Ultimately, though, the present track layout requires eastbound services to cross each others paths on the level because the western flyover is wrongly configured, and there is no getting over that. The day will come when someone says, ‘I wish they’d altered the flyover when they had the chance’. The question is ‘when’, I feel, not ‘if’. 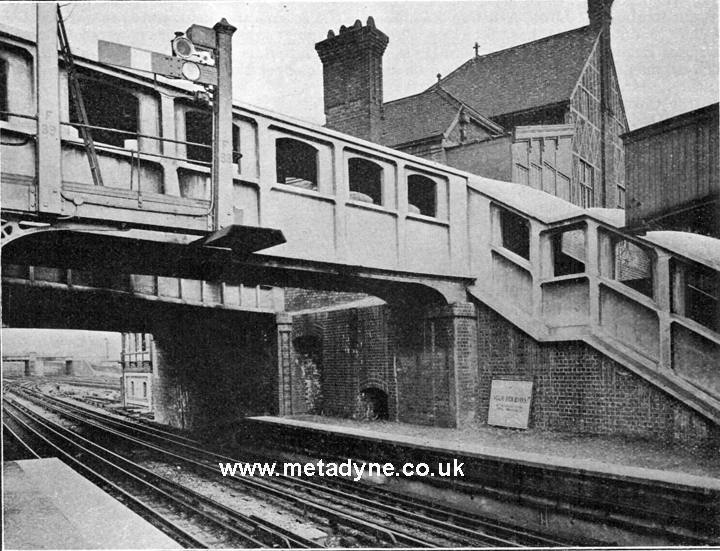 On 5 January 1915 the next stage of the Metropolitan Railway’s widening came into use, between Willesden Green and Neasden. As stated in last month’s blog, Willesden Green had been widened in December and the extra tracks stopped a little way north of the goods yard connections. They were now extended along the north side of the railway through Neasden, requiring comprehensive changes to the depot access north of the station. The old up (southbound) platform was transformed into an island, also serving the new down fast line, and a new up fast platform was installed on the north side. This was accessed from the ticket hall by a ferro-concrete bridge, a method of construction new to the Metropolitan and of which they were very proud. It is still there today. This was followed on 11 January by extension of the widening through to Wembley Park. The extra tracks were this time on the south side of the line, between the old tracks and the Great Central line; as you might guess this was because the old tracks were too close to Neasden Works to install anything new. The position reverted just outside Wembley Park where the new tracks connected into the existing (southern) platforms and the old lines were diverted into what had been the two bay roads. This meant changes north of the station as the bay roads were now the ‘fast’ platforms requiring the tracks to be extended on the ‘straight’, as it were, to make a gentle connection with the old lines about a trains-length north of the station. The old lines, now ‘slow’, were realigned to meet the fast lines on the ‘curve’ as train speeds would be quite low. This arrangement carried on until changes in the late 1930s swept all this away. The station was otherwise unaltered by the 4-tracking. The only other notable event in January 1914 was the introduction of landing control on the lifts at Piccadilly Circus. When the early tube lines were built they needed lifts to connect the station buildings with the platforms, deep below. The number of lifts required was a function of the traffic that was expected at busy times and the cycling time of the lift, which was proportional to the depth of the shaft. Those planning the Yerkes stations generally got the estimates about right, though s few lifts were moved around by way of ‘fine tuning’ and at a small number of locations the estimates were disastrously wrong, perhaps Oxford Circus being a good example. Piccadilly Circus had eight lifts, four for the Piccadilly and the balance for the Bakerloo, reflecting both high traffic prospects and substantial station depth. At the top level each bank of four were on opposite sides of the ticket hall and at the lower level there were no connections between them. Each lift required its own member of staff, the liftman. This individual would open the entry gates by hand from within the lift, check the tickets (and collect them on the way out), close the gates, operate the lift to the other landing and let the people out through the exit gates which were air-operated using a lever at his control position. The exit gates had to be air operated because in a crowded lift he could not get across them very easily. This was not very efficient in requiring a lot of staff and making it very difficult to coordinate the despatch of lifts. There was no means of operating a lift from outside the car except in an emergency. In 1913 the Underground Group aspired to control the despatch of lifts from the landings and not have any staff actually inside the cars, as revolutionary at that time as the idea is today of not having any staff inside the trains. To achieve this, a huge number of technical modifications were required to the equipment, together with the sanction of the Railway Inspectorate who would need to be satisfied the alterations were safe and reliable. This called for a prototype installation and lifts No 1 and 2 at Piccadilly Circus were selected. The additional equipment required included automatic accelerators and banks of relays that would start and stop the lift at the correct places depending on direction, together with landing control panels comprising lamps and push buttons. Perhaps surprising is that the entry gates were to remain hand-operated at top and bottom landings. The landing staff were warned of the arrival of a lift by an illuminated indicator; the exit gates did not open automatically. The lifts were operated in this fashion from the first week in January, during which time a member of staff rode in each lift to provide reassurance. By agreement with the railway inspectorate it was decided to run the lifts from the landings for three months to check all was OK. The experiment having proved entirety satisfactory, lifts 3 & 4 were converted in April. After a further period of reflection the lifts at Great Central were then altered, again using push button controls. The familiar dome controller many of us remember was not developed until later. In later years most lifts were converted to landing control (they could also be controlled from inside the lift if required). I think the last unconverted lifts were at Belsize Park, which I well remember; all four lifts remained in service until the end in unmodernized form. More recently we find that fifty years ago there are several events to comment upon. The Northern City Line then operated between Finsbury Park and Moorgate but construction of the Victoria Line meant enabling works were required at Highbury which required extensive engineer’s possessions. This was part of the scheme to divert the northbound Northern Line via a new platform, releasing the existing northbound platform for use by the southbound Victoria Line. From 11 May 1963, the entire train service was withdrawn at weekends and after 20:00 each evening, a bus service was operated instead, at 7-8 minute intervals. As work progressed the buses were found unsatisfactory and improved arrangements were put in force involving single-track shuttles. One operated between Finsbury Park and Essex Road (on the southbound line) and the other Essex Road and Moorgate (on the northbound line); the services connected at Essex Road and each ran at 16½-minute intervals. The break in the middle was necessary to operate at a reasonable frequency as single line operation along just one track would have meant intervals no better than half hourly. 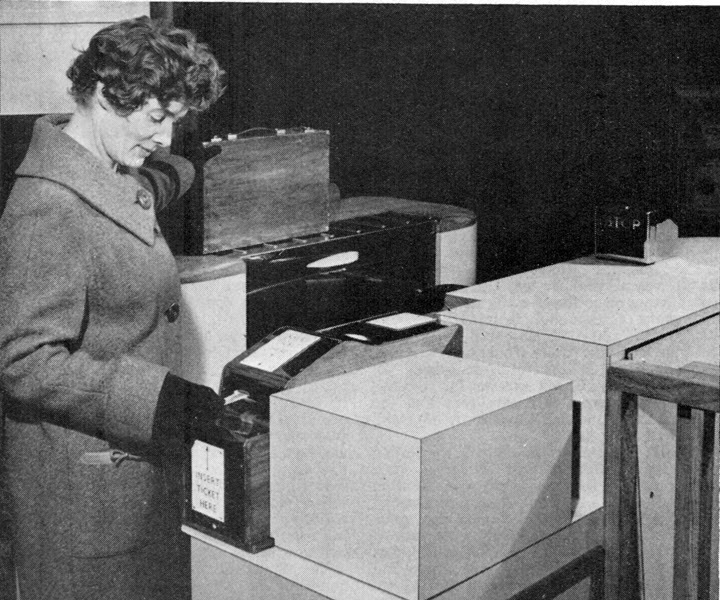 On 5 January 1964 automatic ticket gates were introduced at Stamford Brook. This was the Underground’s first electronic ticket gate and was installed on the ‘way in’. Special tickets were issued using magnetic ink in the form of four parallel ‘bars’ in a block, each bar at right angles to the ticket edge; two blocks were printed, the second opposite the first such that as the ticket was ‘read’ by the gate the bars would be read successively as a pair. The bars represented a ‘ternary’ code where a bar on one side represented a zero, a bar on the other a ‘1’, and a bar on both sides a ‘2’. In this form they were loaded into the gate’s memory as the ticket was read. The machine interpreted the complete code (in this case 2,2,2,2) as a unique decimal number by taking the position of the ternary codes as diminishing powers of 3. With four positions the first ‘multiplier’ was 81 (three cubed), the second 27 (3 squared), the third 3 (three to the power of 1) and the fourth 1 (three to the power of 0). This adds up to 224 which was the station code allocated to Stamford Brook; the codes essentially started at ‘1’ and were allocated in alphabetical order. This was the first of a number of experimental gates installed, as a result of which magnetic ink was found unsuitable and a ferric oxide backing was identified as a better medium to carry the 31 code positions required to handle the Underground’s ticket varieties. In its refined form automatic gates were introduced on the Victoria Line when it opened in 1968-69 but it was found to be inflexible and not reliable enough and later partly removed. Only from the late 1980s was a rather different approach adopted that led to the ticket gating system still in use today. There is an article about how this all developed on my website HERE. First experimental ticket gate at Stamford Brook. About as unattractive a design as one could achieve! Hi – grezt blog, but I wanted to let you know of a problem. When I close the tab, your site pops up a modal dialogue box which deliberately confuses the user. It says something like “I will show you how to monetize your site” and there's either a “cancel” or “ok” option – deliberately named so that people will end up clicking on an action that may harm them. I don't know whether it's just an advert or something malicious, but I urge you to get rid of it. Aside from the user experience (people HATE these kind of boxes – they've closed the tab, which means they have already made their decision as to what to do, so a box coming up asking them not to close the tab is intensely annoying), it's a bit sinister that a user's actions are being intercepted and sent somewhere else, possibly maliciously.